The Mission Hills 5k winds through scenic Mission Hills, one of the most historic and treasured neighborhoods in San Diego. The fun run/walk begins and ends at Grant K-8 School, located at 1425 Washington Place. Participants will pass Craftsman and Spanish historical homes, charming boutiques, gourmet eats and coffee shops galore before crossing the finish line in victory back where it all began at Grant. 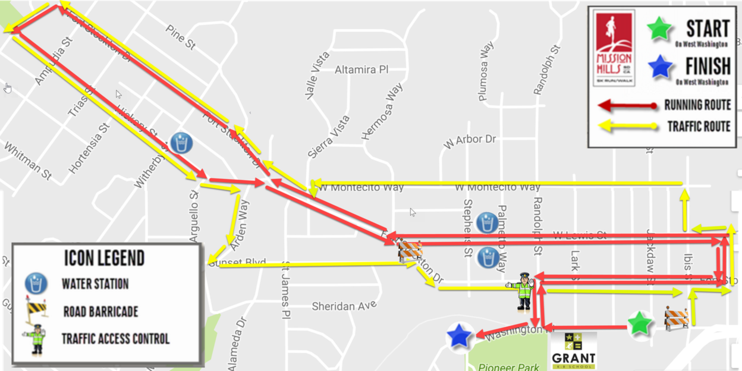 This route has been specifically designed to have minimum impact on members of the community and visitors. Trained personnel will be stationed throughout the route to safely direct traffic. Please note: this event is a timed race! Times and placements in select categories will be available online, and prizes will be awarded to top finishers in specified categories. 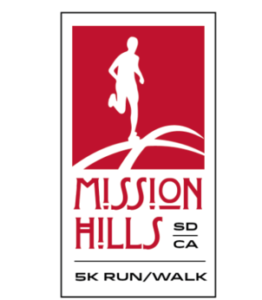 Since Mission Hills is predominantly a residential neighborhood, participants are encouraged to walk or bike to the start line at Grant K-8 School. For those who opt to drive, please consider carpooling. Several parking options are available, though limited. These include residential street parking (be kind: no blocked driveways please!) and metered parking spots on Goldfinch (a short three-block walk to the start/finish line).